How do you handle a situation in which the media does not have the facts and seems not to want them, especially when the reporting is at your peril and has a negative impact on your career and perceptions of your integrity? If you agree—and we’ll assume you do—then you’re like most public people today, no matter the sphere in which you operate, be it politics, business or the local school board. Your only choice is to “handle" the media as it handles you—proactively. To see what happens if you don’t, look at recent events in the financial industry. Every bank that said too little about what it knew or said what it needed to say too late in the game has ended up in the media grinder. Now, we don’t know the specifics of your situation, and it could well be that you’ve already done everything right in telling your story to the media. But before you make that case, ask yourself whether you’ve followed the three best guidelines we know for protecting your career and integrity during a publicity maelstrom. First, have you told the truth, the whole truth, and nothing but the truth? Crazy as it sounds in this day and age, people in a public crisis still cling to the notion that they can control information flow. They think they can tell portions of their story, leaving out the personal, messy or confusing parts, and still have the media (and the public) consider their comments “truthful". The problem is, the media will fill in whatever you leave out of your story with conjecture, rumour?or opinion. Is that unfair? It doesn’t matter. Their job is to tell a complete story. Your job, if you’re in the public eye, is to protect yourself by helping them get it—warts and all—from your perspective, every step of the way. Second, have you transmitted the same message to everyone? If there is one mistake that practically guarantees negative publicity, it’s that of adjusting your point of view for those who are listening. Democratic presidential candidate Barack Obama, for instance, was hit with a barrage of criticism when, after praising the values of religious worship and gun ownership at Midwestern rallies, he appeared to denigrate the same during a private fund-raising party in San Francisco. Business people can do the same kind of thing. We know a former CEO who actually carried note cards so he wouldn’t mix up his separate talking points. He’d have one story for his board, another for employees and a third for Wall Street. No wonder so few analysts trusted him—a reality reflected in his company’s stock price. Finally, have you taken your media coverage into your own hands? It used to be that the media had the last word. The Internet has changed things so there are no more last words. Sure, the Web can be used against you during a media firestorm, what with thousands of amateur news sites and blogs eager to pick up on rumours and innuendo. But that’s all the more reason to use the Internet for your own defence—or offence. Celebrities now speak directly to the public about rumours; companies are increasingly doing the same. Individuals who feel maligned have the same option. You may not be able to change the course of the media coverage to your complete liking, but at least you’ll have an active role in it, and in precisely your own words. Look, there are unfolding crises when a leader can reasonably say very little or claim lack of information. Who can forget how New York mayor Rudy Giuliani, pressed for a death total on 9/11, silenced reporters with, “The number of casualties will be more than any of us can bear." Thankfully, few situations compare with that. Most of the time, when the media clamours at your door, you’ll have the ability to answer reporters fully and protect yourself in the process. The only question is whether you have the guts to engage the media as it engages you. Jack and Suzy are eager to hear about your career dilemmas and challenges at work, and look forward to answering some of your questions in future columns. 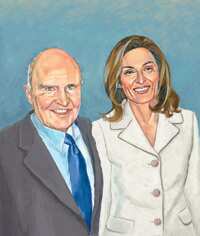 Jack and Suzy Welch are the authors of the international best-seller, Winning. Mintreaders can email them questions at winning@livemint.com Please include your name, occupation and city. Only select questions will be answered.